Happy Earth Day! In honor of, well, the Earth, I wanted to share one of the best earth-friendly beauty programs around--from Tarte Cosmetics. Until now, you've probably tossed your used up makeup tubes and compacts or stashed them in the back of your bottomless makeup drawer. But Tarte has come up with a better plan. Send them your empty clean slate primer and/or smooth operator SPF 20 foundation and they'll give you 15% off of your next complexion purchase (products include: clean slate, smooth operator, pressed powder, mineral powder bronzer). Sweet deal, right? There's more. Send your empty slide tin lip balm with SPF 15 and tarte will give you 15% off of any lip product purchase. Or send your empty cheek stain and receive 15% off of your next cheek stain purchase. You can do some good for the planet while stocking up on your new spring/summer makeup essentials. Go to www.tartecosmetics.com for more info and get Earth-friendly today! So it's supposed to protect skin from free radicals--well, it actually feels like it does. 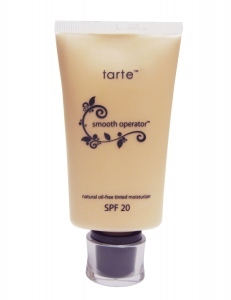 The smooth, silky cream feels nourishing and protective the minute you smooth it on. Dubbed "the natural Botox," Naturopathica Beech Tree & Ginseng Daily Moisturizer ($56) blends antioxidant rich Beech Tree and Goji Berry with a firming complex of Ginseng to form a very luxurious product. One application actually made me feel like I just got a great facial as soon as I rubbed a drop into my normal-to-dry skin. The best part: The product is ECOCERT certified and comes in a carton made from 100% recycled fibers and a bottle made from 100% post consumer PET plastic derived from diverse feedstocks of post-use recycled containers. Translation: It reduces your carbon footprint too. Pick up a bottle at www.Naturopathica.com and spas nationwide. All I ask is, just smell it--the ginger, mandarin and lime scent simply makes you happy in just one squeeze. Not just because you're doing something great for your hair, but you're doing some good for the Earth at the same time. 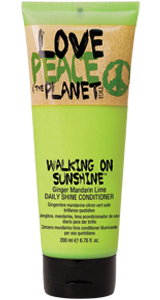 I'm talking about Walking on Sunshine Daily Shine Conditioner from TIGI's Love, Peace & the Planet Collection. The creamy formula has honey, jojoba oil and soy protein to add moisture and strength and leave your hair smooth and shiny. The line of nine products features natural and organic ingredients combined with a minimal amount of synthetics. And all bottles and tubes are made from 50% post-consumer recycled materials and are 100% recyclable. Also designed to revitalize your senses: Totally Beachin' Body & Waves Styling Mist in Coconut Mango Vanilla (yum!) and Free UR Mind Firm Hold Hairspray in Cherry Almond (prices range from $18.95 - 22.95). Look for them in fine salons nationwide or go to www.tigihaircare.com for more information. The perfect makeup brush is hard to find. It has to handle well, apply smoothly, distribute evenly, feel soft on your skin...and it wouldn't hurt if it was eco-friendly. Priori's eco-friendly, cruelty-free brushes rank high on my list. Their handles are made from bamboo with a stem made from recycled aluminum. The soft bristles offer anti-bacterial protection and flawless application. You won't find these essential tools in just any professional makeup brush set. But you can check them out at www.priori.com. There's the Kabuki Brush ($20), made with densely packed bristles--ideal for buffing, blending and getting into hard-to-reach areas like dark under eye circles or the bridge of the nose. There's a Concealer Brush ($25) with taklon bristles to tackle the heavy duty job of offering heavy coverage. And, my favorite, the Powder Brush ($25), designed for applying PRIORI® Finishing Touch and Sun Kissed products. It boasts shed-resistant taklon bristles for a soft, beautiful finish. I seriously have never felt a softer makeup brush on my skin. It's even said to gently massage and increase circulation to the face. TIP: Use Priori's CoffeeBerry Revitalizing Cleanser to clean them regularly so that they will stay fresh and last longer. Go to www.priori.com for more info.